Some experts see the sharp rise in smartphone use behind the rise in pedestrian fatalities. Cities around the world have begun addressing the problem. You see them everywhere: people walking with their eyes glued to their mobile phone screens on busy streets. But walking and texting can be dangerous — and cities in the United States and Europe have begun to do something about it. Honolulu recently passed a law that allows the police to fine pedestrians up to $35 for viewing their electronic devices while crossing streets in the city and surrounding county. Honolulu is thought to be the first major city to enact such a ban. “This is really milestone legislation that sets the bar high for safety,” said Brandon Elefante, the City Council member who proposed the bill. Pedestrians, he said, will share the responsibility for their safety with motorists. In the United States, pedestrian deaths in 2016 spiked 9 percent from the year before, rising to 5,987, the highest toll on American roads since 1990, according to federal data. One reason may be the sharp rise in smartphone use, “a frequent source of mental and visual distraction” for both drivers and walkers, a report by the Governors Highway Safety Association found. “I’m guilty myself,” said Charles Chan Massey, chief executive of Synaxis Meetings & Events, a management firm, who uses the time walking to and from meetings and business lunches to catch up on calls, texts and emails. There is a dearth of data directly linking distracted walking to pedestrian injuries and deaths, but it seems to be a global problem, too. Preliminary studies “give a hint to unsafe behavior,” said Dr. Etienne Krug, director of the Department for Management of Noncommunicable Diseases, Disability, Violence and Injury Prevention at the World Health Organization. A number of other cities have come up with creative ways to help protect cellphone zombies, who talk, text, listen to music, check their email and even snap selfies. Initiatives include low-tech efforts, like edgy signs in Hayward, California. (“Heads Up! Cross the Street. Then Update Facebook.”) and no-selfie zones in Mumbai, India, and innovative traffic lights in Europe and several pieces of legislation proposed in response to Honolulu’s new law. 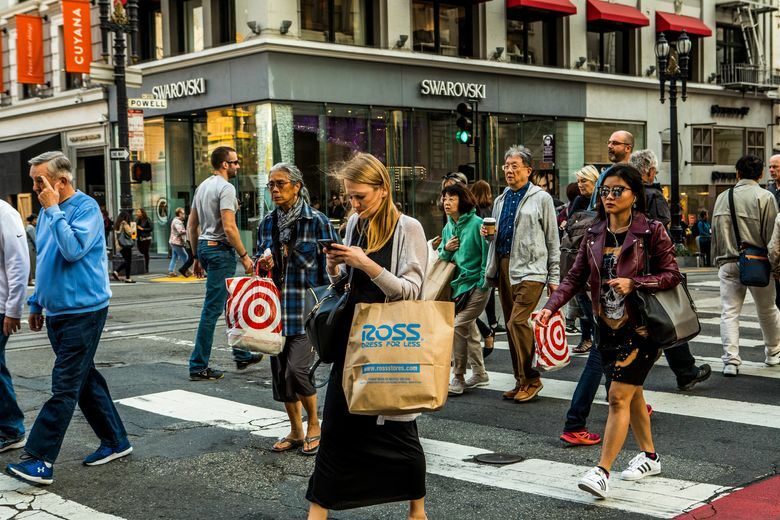 Last month, the board of supervisors in San Mateo County, California, unanimously passed a resolution prohibiting pedestrians’ use of cellphones while crossing streets. It’s not enforceable, as state law governs such issues, but David Canepa, who introduced the measure, said it was an important springboard; the resolution is expected to go to the California Legislature for statewide consideration in January. At least 10 states have debated similar legislation dealing with distracted pedestrians or bicyclists; none of it has passed, according to the National Conference of State Legislatures. 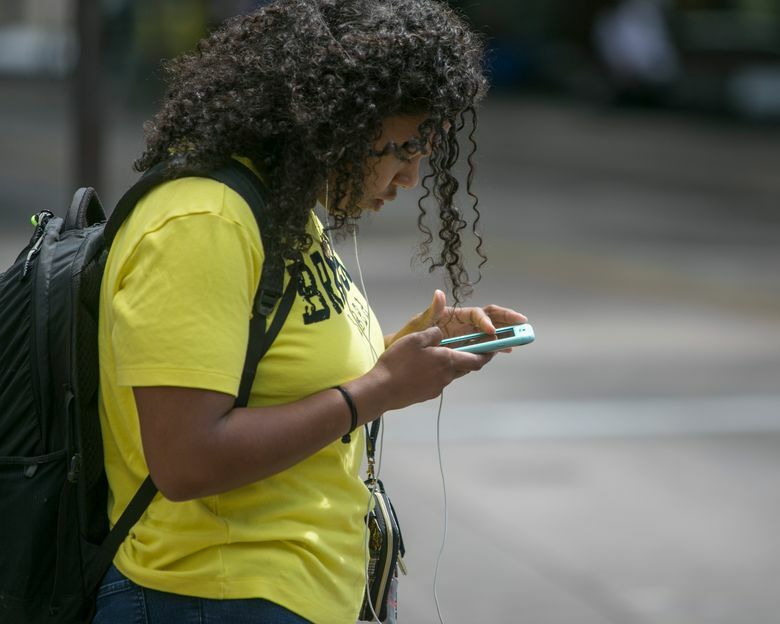 Legislation is pending in two states, the group said, and in September, New York passed a law that directs New York City to study its efforts to educate the public on the dangers of distracted walking. Municipal laws are not tracked, but Rexburg, Idaho, may have been among the first to adopt a citywide ban, in 2011. The city recorded five pedestrian deaths in a short period in a concentrated area. It was a high toll, given the city’s size: about 35,000 residents. “It was a shock to our system,” said Stephen Zollinger, Rexburg’s city attorney. Bodegraven, a small town near Amsterdam, tried a different approach. This year, it embedded LED-illuminated strips in the crosswalk at a busy intersection — right in the line of sight of people staring at their phones. When the traffic lights turn red or green, so do the lights at ground level, alerting pedestrians when it’s safe to cross. The pilot program aims to anticipate trends, not reverse them, said Dolf Roodenburg, the project leader and a traffic engineer in the Netherlands. If it’s successful, the town hopes to install the lights at more intersections and on bike paths, and offer them to other cities. In Augsburg, Germany, similar lights were installed last year after a teenager using her smartphone was struck and seriously injured by a tram when she walked onto the tracks. There are, of course, contrary points of view on the effectiveness of legislating pedestrian behavior. Janette Sadik-Khan, a former commissioner of the New York City Department of Transportation and now transportation principal at Bloomberg Associates, which advises mayors around the world, said laws against texting and walking were not the answer. They have no basis in any research, are poorly conceived and distract from the road design and driver-behavior issues that are responsible for most crashes, she said. She and others recommended focusing on proven strategies like vehicle-speed reduction, which is one of the most effective ways to reduce deaths, as survival rates are higher in low-speed collisions. Vehicle design can also help. “In some countries, cars are designed to be more forgiving to pedestrians,” said Deborah A.P. Hersman, president and chief executive of the National Safety Council. Making bumpers softer and modifying the front ends of vehicles can reduce the severity of a pedestrian impact, but only 44 countries, mostly in Europe, require manufacturers to apply these protections, according to the WHO. The United States is not among them. Massey of Synaxis said it would take some convincing for people to see value in laws to combat distracted walking.